Most people think that if a person’s visual acuity is 20/20 their vision is ‘normal’ or ‘perfect’. Visual acuity is a measure of the clarity of a person’s vision and is tested by having a patient read a line of letters on an eye chart. This test does not require the same amount and types of eye movements that reading does, so it cannot be used to determine whether a child has the visual skills necessary to read. While clear vision is important, it is only one of many visual skills required to be able to read and learn. What are some of the visual skills that affect learning? Directionality is important in understanding how similar shapes can have different meanings when they are in different orientations. 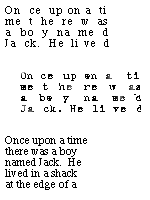 Below is an example of some letters that are commonly reversed by children with poor directionality. The letters are the exact same shape, but are called a different name depending on their orientation. This can be a difficult concept because if another object, such as a chair, is turned on its side or upside-down it is still called a chair. Below is an example of an item from a visual perceptual skills test. In this particular test the child is asked to identify which form among the choices at the bottom matches the form on top. 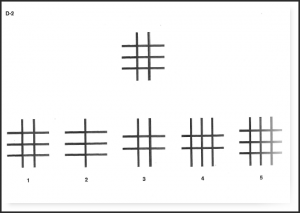 Other visual perceptual skills tests assess the child’s ability to identify a form from memory, identify which form is oriented in a different direction, identify a form that has a different size or orientation, identify a sequence of forms from memory, identify a figure hidden in ground and identify an incomplete form as if it were complete. Children who can read at accelerated speeds often have a good span of recognition, allowing them to recognize and process several words at one time. Children lacking this skill may only be able to see one word or letter at a time. In order to see what this would be like, try reading a sentence or paragraph while looking through a straw. Visualization is the ability to create mental images. Children who have vision problems may also have difficulty with visualization. This skill is important for success in many school subjects including spelling and math.